I am going to buy new lights for my 55 gallon mix reef tank. 18 inches deep and 36 inches left to right and 18 inches front to back. The tank is in my living room. So my wife has to approve. Anything hanging from the ceiling won't fly. And we wouldn't want the light so bright coming around the tank or between the light and the tank that it would be blinding or distracting. And the "disco" effect, I've heard raised with LEDs, is something that I'm concerned about. And I'd love to have something that provides shimmer. The Photon V2 and Kessil AP700 both look attractive. Anyone have any insights on either of these two lights or maybe another recommendations given our needs. I just got a photon 48 on black friday. I have a verrry slight issue with 2 specific LEDS (both purple) not blending in on my photon but it is only problematic on certain channel intensities. The rock is definitely a different color where it is shining but it is cured once my other channels ramp up. I have minimal shimmer. The light itself is very nice looking and I would think it would look nice hanging by itself. I am restricted by my canopy so it is hanging a little too close to the water than I want. I think once I raise it, my blending issue will 100% go away. I'm sure if I had more surface agitation, I would be getting shimmer, but I'm not much of a shimmer fan. How far off the water do you have the lights? I didn't see anything about recommended distance between the water and the lights for the Photon. Just curious. Why don't you like the shimmer? If you are concerned with "disco" (i.e. color separation from individual diodes exacerbated with surface agitation), the ReefBreeders (which is currently out of stock in the 32" size, which is $500) would carry the greatest risk, as the diodes are widely spaced apart - good for coverage, but not for color blending (at least at the height it would be with the mounting legs - less an issue if used higher and hung). Comes with mounting legs. I have used this light in the 24" size, but replaced it with a Maxspect (see below). The Kessil AP700 would not have an issue with color blending as the diodes are tightly spaced and under one lens (two clusters). It can be mounted with a pair of accessory arms, but now the total cost is over $900 (and that is with the recent discount on the unit itself). I am one of those aquarist that finds the overall color rendition of Kessil lighting a bit bland, but that is a personal view - others love it. Well known for appealing shimmer. However, not sure if wifi app has been improved - was a source of frustration initially and for some time after. I have not used this light, but have seen it in person over multiple aquariums owned by acquaintances and retailers. Another option to consider would be the Maxspect Razor X 150 (between $520 and $530 depending on vendor) - three clusters with reflectors, not lenses (reduces "disco"), can be controlled via onboard controller or add-on hub (if one wants remote app programming). Brand new light, but an upgrade on the previous generation (full disclosure, I use three of the first gen, and love them). Also comes with mounting legs. Shimmer would be mild, but better than ReefBreeders (not as good as the Kessil). You would need multiples of other common fixtures, but a pair of EcoTech Radion XR15's would also be a good option, but again pricey - figure around $1000 for the lights and mounts. I have not used the Gen 4 model, but currently use a Gen 3 Pro XR30 - very nice light, but pricey. I believe the Maxspect delivers the most "bang for the buck" for a mixed reef. There are also cheaper "black box" options, but their quality and color rendition leaves much to be desired IMO. to compare to the ap700. Its a bit more compact with the LED layout but not as good as a kessil with how dense they can pack the LEDs. Putting the light further or closer to the water won't really help the disco effect.. If you put it too high off to mask it then you lose a lot of PAR and have a lot of bleed over. Basically anyone sitting down and looks at the tank will be blinded by bleed over. One point to consider is that most of the 'disco effect' is caused by just the red and green leds. It's because there are so few, and as stated by zooman above, because they are spread so far apart. But in my Photon V2 there are only 4 reds and 4 greens out of 88 leds and half the blue and all the whites are 5 watts rater than 3 watts. The red and green leds may or may not have some effect on the coral, it's still very questionable in my mind. Since white light has a mix of spectrum so there is already red and green in the total mix. Therefore, I turn the red and green leds off except during the brightest midday 4 or 5 hours and they really don't have much disco effect then. During the 4 hour sunrise and 5 hour sunset I don't use the red or green and there is NO disco effect at all. I have some shimmer, but it is not as much as leds with pucks. But then leds with pucks have more issues with shadows being darker and the undersides of branching sps corals not doing as well. The V2 has the same issue, just not nearly as bad. IMHO the V2 is about as good looking as a fixture can get. RR is correct - most "disco" is from distinct red and green diodes spaced too far apart, but notice I said most. I have noticed it even with white and blue diodes alone. Unfortunately, the individual red/green diodes are there for a reason - some aquarists prefer the bump in color rendition they give. I'll let you know what I buy and want I think of it once I get it over the tank. Due to my canopy and the design of the included hanging hardware, mine is hanging around 5" from the water line. I'd like to get it higher, say around 8". Just need to figure out a cheap easy modification. Thanks for letting me know that about the shimmer. I was wondering if that was the issue - distraction. Maybe I'll do a quick poll to see what people say. I am going to buy new lights for my 55 gallon mix reef tank. 18 inches deep and 36 inches left to right and 18 inches front to back and have decided to go with a maxspect. I'm thinking of the X150. But, just curious about the maxspect ethereal and the maxspect recurve. I would need to buy two the maxspect ethereal or one of the maxspect recurve. Those would be twice the cost of the X150. Anyone have any thoughts or know about the maxspect products and why the recurve and ethereal are so much more expensive and are they worth the extra$$$. Simply put, the Ethereal is best for a square footprint (i.e. cube tank) of 24" x 24" (or up to 30" x 30"), whereas the Recurve is similar to a Razor X (less diodes per cluster as some are shifted out to the accessory LED light strips), but is for those who are really trying to cut down on shadowing and trying to broaden the light field when keeping primarily SPS corals. The Ethereal appears to be discontinued already as well (though still available at most retailers). I personally would not upgrade to the Recurve at that price point unless I was keeping a SPS-heavy aquarium. One more question. My tank is 36 inches long. The razor 150 is 27 inches long and the razor 200 is 33 inches long. They both will cover the tank. But I'd like to keep the lights lower to the tank than higher. I'm thinking if I go with the shorter 150 I'd have to keep the light higher so that is covers the tank. If I go with the longer light, the 200, it would cover more of the tank at a lower height. Is this correct? You are correct, the larger fixture will give more light over 36", but the question is do you need it? The diode clusters in the new Razor X do not use secondary lenses, but use reflectors, which means they have a good spread (probably 120 degrees), and the effective coverage is listed at 35"-40" (max at 48"). Two things to keep in mind: 1. aquascape of the rockwork in the aquarium and 2. coral species/ types being housed. 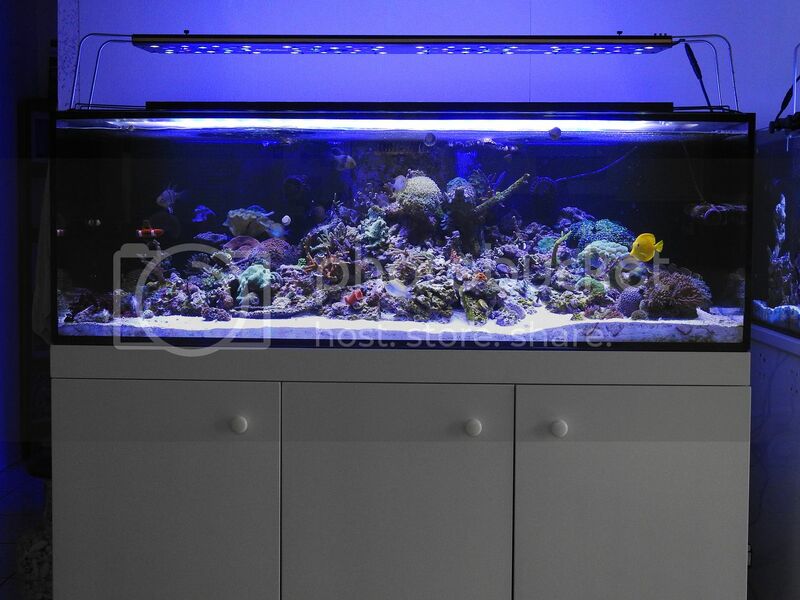 You probably won't be placing liverock at the very ends of the tank, and won't need as much light for 3"-6" at each end, which now means you effectively need to light 24"-30" worth of space. Also, whether you are planning on primarily soft corals, primarily hard corals (differences between LPS and/ or SPS matter too), or a mix of both soft and hard LPS corals means that you may prefer/ need more overall coverage from your fixture, or it will be sufficient. While soft corals are typically more "forgiving" with many parameters, some do appreciate rather high lighting (more than many LPS for example), but suffer less from directional shading. You mention a mixed reef, but what will be the most common coral type? I say that unless you are planning on primarily SPS corals, the smaller Razor X 150 will be sufficient. If in doubt, get the larger X 200 and run it at a lower overall intensity. I bought the Maxspect Razor. I thought I'd ramp the lights up overtime to accilimate the corals to the better lights. I had Current Lights before. I have LPS and soft corals. The preset program (preset 3) is for LPS and soft corals. The highest light setting is between 50 -60% per the manual. When I bought the light and had it at 100% it was spectacular. But at 60% it looks simlar to the old current. I will say that the corals seem to be doing better with the new lights. I had the new lights one week. Any thoughts about increasing the intensity of the lights. At least for a couple of hours at night when I'm home to enjoy. Sure, you could increase the total output, but I would do so slowly, and in relatively small increments - maybe 2% for a set period of time (a week per increase for example). I would not increase the max output more than 5% per period of adjustment. Some soft corals can tolerate or even prosper under relatively high light intensity, whereas many LPS corals tend to prefer moderate light and suffer under higher light intensities, so placement of the individual corals will be important too. This will be relevant with a tall and narrow aquarium like yours. Hey Zooman72. Thank you for your advice. Could I ask for a bit more help? What do you think of these TP. I was also wondering about when and if to move the corals. I have Candy Cane and a Lobo (center left) and a couple that I'm embarassed to say I don't know what they are except that they are LPS. These are in between the Lobo and candy cane. Do you have any recommendations regarding what point in the acclimation process they should be moved? Or whether they should be move at all. Also, where should they go? For your sunrise, you can go full spectrum (all channels), or just keep it to blues and violets (B & C or just C). If you want to mimic natural conditions with sunrise and sunset, your timepoints should be a mirror of each half (i.e. 1-3 opposite of 4-6) so that you have a bell curve in the intensity profile. If you want it to highlight the look of corals when you are around it most, your can pick the color profile you like and adjust to taste. I see TP 2 and 5 are not identical, which I take to mean that you are highlighting when you are present to observe. I also note that you are maxing out at 85-90% for 2.5 hours, which is fine if your corals can handle it, which leads me to your other concern - coral placement. Unless you have a PAR meter and records of preference for the corals you are keeping, you have no other choice but to "read" your corals' responses to the increase in lighting. LPS will look "unhappy" by not expanding and fading in color when light stressed. This means you have to know what "happy" looks like and proceed from there. My older Gen 1 Razors max out at 80% some 12" above my 40B's (16" deep mixed reefs with anemones), whereas your tank is a bit deeper, so you might be OK with a slightly higher max intensity, but your fixtures are a bit more powerful, so be careful and patient, and good luck! Thanks so much Zooman! Very helpful. You are welcome, and I try to be - good luck! I've been running the lights at a max of 45% now. Mushrooms! They are growing like never before. Actually mushrooms haven't done well in my tank in the past. I thought that mushrooms did better than other corals in low light. But the improvement in the growth of the mushrooms has been obvious is just a couple of weeks. If you look at the base of the Kenyan Tree you can see a little mushroom. That was a spec a couple weeks ago. Now it has a stem and looks like a mushroom! These guys below have grown quite a lot since I got the new lights. In general most of the corals look better since I got the lights. I'll give an update down the road to let people know if the success continues. Of course, any comments/suggestions about the tank would be welcome. And thanks for all the help with the lights!